ALEX is one of those novels which spoiler-averse reviewers can’t discuss the plot of in much detail so all I’ll offer is that its first act involves the kidnapping of a young woman from a Parisian street. We see the capture, confinement and torture from the point of view of this eponymous character. Indeed so vivid is the depiction of Alex’s physical and psychological torture that imaginative readers could be forgiven for thinking they themselves have dangled from the ceiling of a warehouse in a small wooden cage…beaten…thirsty…cold…acting as unwilling bait for brazen urban rats. In the first of several plot contrivances that I never quite ‘bought’ Alex’s kidnapping is observed and reported to the police. It is the convenience of this I found clunky as it soon becomes clear that no one would have been looking for Alex for quite some time and that without the community-minded bystander happening by at just the right moment the police investigation could not have been brought into the story at this point (or possibly ever). The fact that the police so thoroughly leap into an investigation at all – essentially throwing their entire resources behind searching for “a woman” and “a van” further stretched my credibility. I suspect most police forces would require a bit more than the vaguest of descriptions of a possible crime before doing much more than making a note, but perhaps French authorities operate differently to those I have direct experience of. Regardless of how they come into play the police are introduced early and form an integral part of the story. They are an ensemble I suppose though the lead is definitely Camille Verhoeven, a diminutive Commandant who is reluctant to take on the case as he is, four years after the event, still not fully recovered from the kidnapping and murder of his own wife. But he steps up to the plate and ultimately uses the case to help him gain some understanding of his own psychology as well as leading the complex hunt for a missing woman and the subsequent investigation. I can see what it is that people like about ALEX. The plot draws the reader in from the very beginning and has perfectly placed twists designed to keep the reader permanently wrong-footed. It is the very definition of suspenseful. But, for me, it was all a bit hollow. Part this stems from the level of violence. Most of it isn’t gratuitous, i.e. ‘without apparent reason, cause or justification‘, because most of the characters who commit the stream of barbarous acts depicted ultimately prove to have an understandable reason for doing so (even if their justification is a far more subjective matter). But it is all brutal and, for me, unnecessary, preventing me from connecting with the people or their story. By the end – when a final hideous act is being described in yet more lurid detail – I had begun to wonder if the violence level had been amped up to titillate and excite rather than to contribute significantly to plot or character development. I do appreciate that everyone’s tolerance for violence is different (and that as a crime fiction reader I need to have some stomach for this element of a story) but, for me, the quantity and graphic nature of the violence in ALEX was not warranted by the pay-off. The rest of the hollowness came from the ‘extreme’ nature of almost everything in the novel, not just the violence. Hardly a single character reacts within what I think of as a ‘normal human range’ to their life experiences which meant this was not a book describing events I could imagine actually happening in some version of reality. I can’t say this is a failure on the author’s part as it’s a perfectly legitimate artistic tack to take but, increasingly, not one that appeals to me. It seemed as if Lemaitre was testing how far he could go – how debauched could he make this character, how vengeful another – rather than trying to create a credible community of people. I’m not averse to a good dose of escapist reading at all but for me there are a couple of elements I am increasingly uncomfortable with and when I find them I struggle to enjoy a book on any level. One of these is an abundance of brutal violence of the kind I’ve already talked about. The other is the lack of anything approaching a normative depiction of gender traits. In ALEX there are few female characters to begin with and those who do appear are either victims or abusers of some kind. For the record I don’t like books in which all men are depicted badly either but here though there were some truly horrendous male characters these were at least balanced by the policemen who might all have had some personal baggage but displayed some human decency and functional psyches. ALEX is ably translated by Frank Wynne who seemed to use a kind of universal version of English which mixes American English and English English in the way that most of us who reside outside those two places are entirely used to, and my version of the book was narrated superbly by Scottish actor David Rintoul. It is not a book for those who eschew graphic violence but it does offer a genuinely surprising storyline if you’ve got the stomach for it. 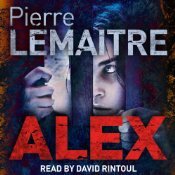 This entry was posted in book review, France, Pierre Lemaitre. Bookmark the permalink. Bernadette – I’m not much of a one for a lot of brutal violence in a story. When I first read reviews of this one I wondered whether the level of violence might be more than I wanted to read. After reading your review I think it probably is. Thanks for your your (as ever) excellent and thoughtful review. I’ll have to compare notes, once I’ve read my copy. Thanks for this very nuanced review, Bernadette. I have yet to read ALEX, but have been intrigued by the level of word-of-mouth recommendation it’s been receiving: it was *the* novel that kept being mentioned to me at CrimeFest as a must-read. Interestingly, everyone started off by saying that the first chapter was incredibly violent and that they had had to ‘get through’ that before the novel started to deliver (the advice was not to be put off but to keep going). I suspect that I will end up reading it out of curiosity, especially as so many people have praised the clever twists, but may well have a similar reaction to yours, as I’m not keen on graphic descriptions of violence either. I find it much easier to skim violent parts in a book vs. fast-forwarding an audiobook, so I may try it when it’s available in the US in the fall. I don’t think I’ll read this and appreciate a thoughtful review as always. But if I do read a book with a lot of violence, as in the Stieg Larsson Millennium trilogy, I skip those sections, even a chapter if it has those tell-tale italics. Not for me. After giving this some thought and rereading this review, I will skip this book. The violence, which seems to continue throughout turns me off. I don’t understand this trend to up the ante on the graphic violence to sell or “popularize” a book. And violence against women? There is so much in this world; statistics at now one in three women globally will be the victim of violence. I’d like to know the reasons why there is more and more violence, especially against women (and against children) in mysteries now. Is it a substitute for a good story, good dialogue, character development, i.e., good writing? Is it what publishers think will sell? And if it contributes to good sales, as the eminent Maxine Clarke used to say, “Who are the people who are drawn to it and why?” I shudder to think about this. It is a very brutal book, but I thought that worked given the context – as you say, the motives eventually become clear. I totally agree that everything was a little over-the-top: I wonder if there are any normal policemen out there at all in the fiction world?! That said, I loved how it twisted everything one thought around and one had to start all over again in one’s preconceptions. Thanks for a very helpful review Bernadette. I’ve been wondering about this book, and I think you’ve convinced me it may not be for me: the way you described your reactions to it was very thoughtful and, as I say, helpful.